Note: I intend to cover some hikes and trips that I did before the launch of this blog. Hence the “backtracking” title. The plan: Galena Creek Trail. Church’s Pond, from the Galena Creek Center off Mount Rose Highway. 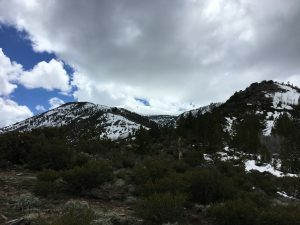 Per Mike White, the full loop is a “difficult” 10-mile jaunt, up Jones Creek canyon to a ridgeline – where the spur trail leads off to Church’s Pond – and down the north side of the ridge through Whites Creek canyon. Hiked on May 1, 2016. 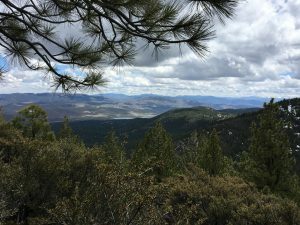 From the trail looking east over Washoe Valley. By friend Bill wanted to get out on a trail with his dog Raven, a lab/German Shepherd mix. We figured that coming off a pretty decent winter most trails at any sort of elevation were probably still snow-covered at this point. Not looking for anything big out of the gates this spring, I suggested the Galena Creek Trail, which is more so a nice meandering walk from Callahan Ranch Road south of Reno, through the exclusive Montreux Golf & Country Club neighborhood and on up near Mount Rose Highway as it bends south into the treeline. It’s a trail I’ve been on a few times before and one that sees decent traffic. The problem was that our planning conversation was via text message. I arrived at the trailhead and Bill was nowhere to be found. Instead, he was a few miles up the road at the Galena Creek Visitors Center (GCVC). It was a pretty easy miscommunication because the names are the same. But the locations are a couple miles from each other. 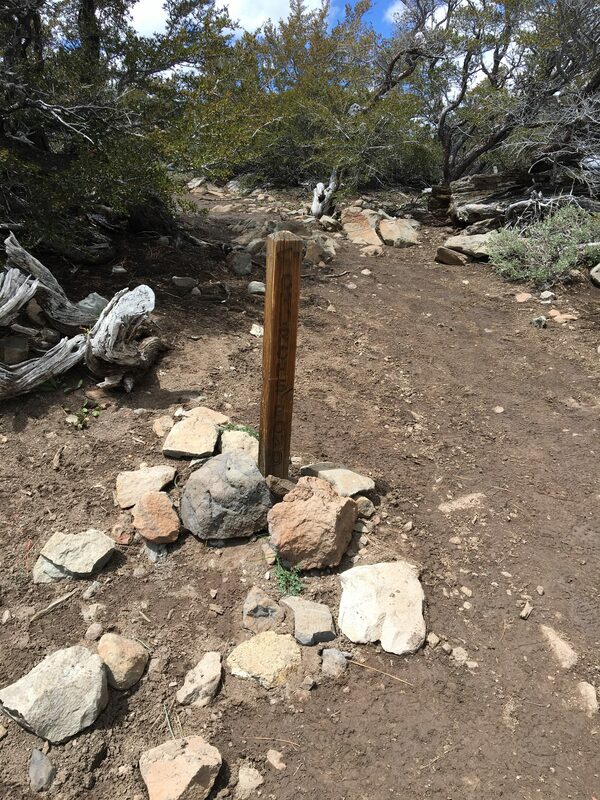 The trail I had intended is Galena Creek Trail and sometimes known as “Lower” Galena Creek Trail, (although the sign at the trailhead off Callahan Ranch Road doesn’t exactly bear that five-lettered descriptor). The GCVC serves as a launching point for the Jones/Whites/Thomas Creeks Trail System. Are we all sufficiently confused now? Wanting more than the short Jones Creek Loop and not having the time or the ambition for the 9.2-mile Jones Whites Creek Loop, we decided to make the climb towards Church’s Pond. Snow was certainly a possibility, we figured, but the plan was to get as far as we could go. I hiked the Church’s Pond trail with Moose for the first time in spring of 2015 but it was a little later in May and coming off a terribly dry winter. Moose and I hit the pond that day with virtually no snow and barely any moisture on the trail that would’ve reflected recent snowmelt. Today would be a slightly different. The trail doesn’t waste any time in getting the heart rate up. You meander away from the parking lot for a short bit before a stream crossing that eventually yields a junction. Heading up the creek canyon, the elevation gain comes quickly and doesn’t let up for a while. 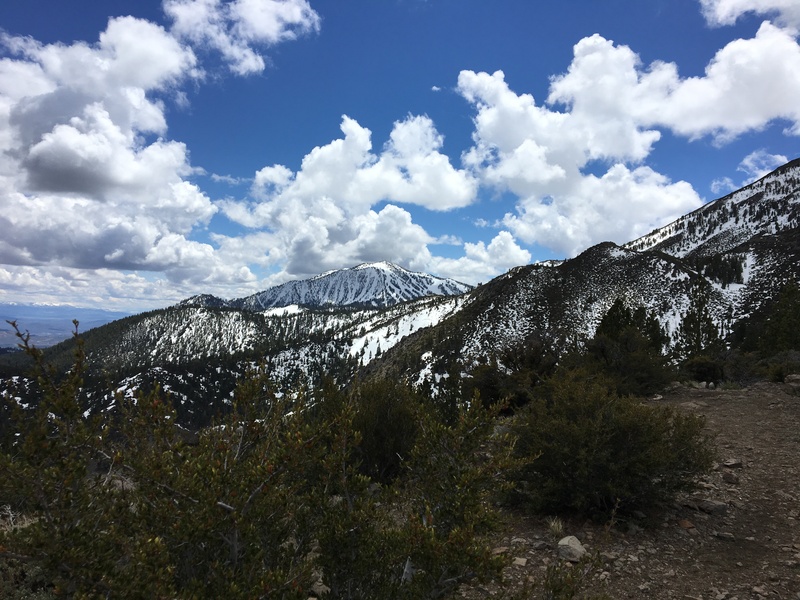 Within a mile or so, you’re officially in Mount Rose Wilderness and still gaining elevation. From the trailhead to the ridgeline is a little over two miles and the elevation is roughly 2,000 feet in that time. It’s not quite a Stairmaster, but it is a constant climb. What makes the climb easier is that the views get better the higher you go. As the trail moves up the Jones Creek canyon, it eventually moves into a series of switchbacks to gain the ridgeline. 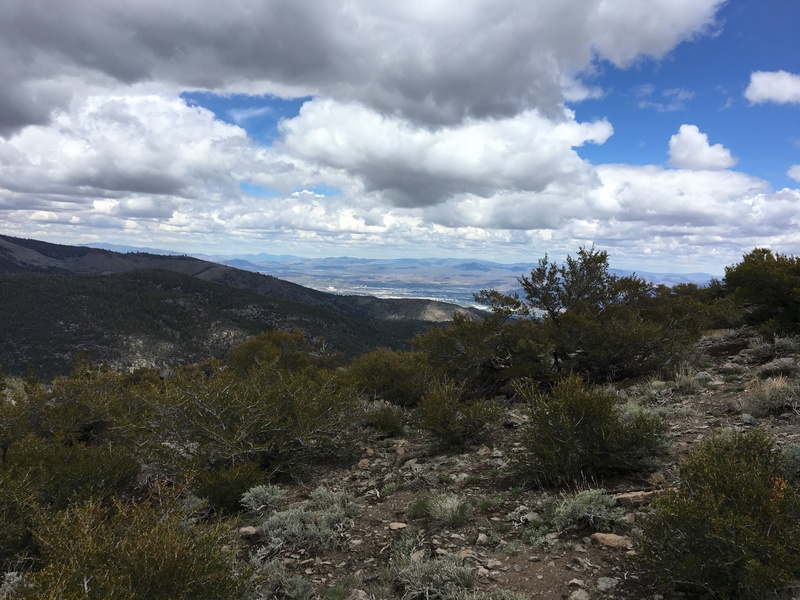 Along the way, some neat views of Washoe Lake and the surrounding valley become available. There are also good views of Slide Mountain and, this time of year, the face of The Chutes at Mt Rose Ski area. The weather was cool but certainly pleasant. Both of us were in shorts and pullovers, which was perfect. Traffic on the trail was fairly light but we asked the few folks we came across where they snow level was. Just past the ridgeline (further on the loop trail) was the answer. I suspected that meant the spur to Church’s Pond was snow-covered as well. I was half-right. We reached the spur trail and took a break to give dogs some water and a snack. I snapped a few pictures before leaving my small pack and Moose with Bill to explore the spur to Church’s quickly. Within 50 feet, I was ankle deep in mud. I went a bit further, just off the trail, and there was snow straight ahead. Having already done more than what we bargained for, Church’s wasn’t in the cards today. Overall, it was an enjoyable day. It was fun to be on the trail with Bill, who’s an all-around good dude. And with Raven with us, it marked a chance to work with Moose on behaving a little better around other dogs. He’s not yet 2 years old and still has some excitability issues. I have a lot on the hiking to-do list this year but one of those things is to explore some local backpacking. I’m pretty sure this area would be great for that. My friend Ryan (this guy, who’s about to go climb Denali) has spent a lot of time around the Mt. Rose Wilderness and he’s referenced some cool places. Gear: Nothing elaborate. I took an ill-fitting old backpack with some water bottles and a snack for Moose. Was reminded once or twice on the hike as I readjusted the backpack (again) that I need to take a look at a little 20-liter daypack – something with an external bladder pouch. Per usual, I forgot my hiking sticks. Post-hike beer: Imperial Six Demon Bag from yours truly. This keg of homebrew was on its last legs. We took care of it. The original Six Demon Bag is my take on one of my favorite beers, RPM from Boneyard Beer in Bend, Oregon. This batch was bigger all the way around, with more booze and more hops. It hit the spot. I kept waiting for a great shot of the Mt. Rose summit and the opportunity never came around. Seems like there was cloud cover every time I had a clear angle.